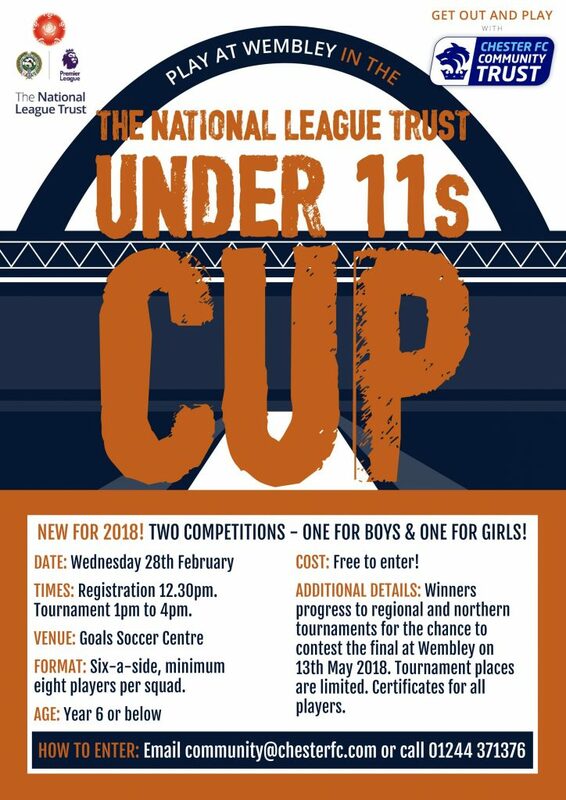 The National League Trust Under 11s Cup returns for 2018 with Chester primary schools invited to compete for the chance to reach Wembley. 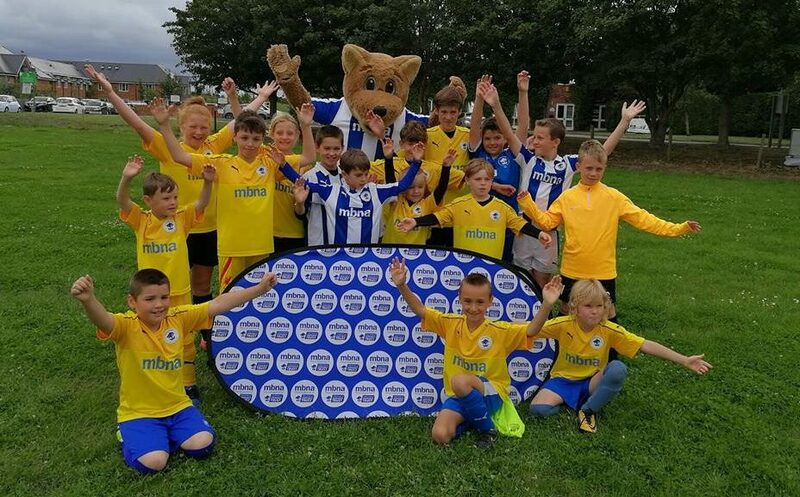 Following the success of last year’s tournament, in which Tattenhall Park Primary School triumphed to be crowned Chester’s champions, Chester FC Community Trust is again taking part in the national competition. This year the event has been expanded to include a girls competition as well as boys and entries are now open. The tournament will take place at Goals Soccer Centre on Wednesday 28 February with the winners going on to represent Chester FC at the regional finals, where schools will battle for a place in the overall final at Wembley on Sunday 13 May prior to the National League promotion play-off. The tournament is free to enter but spaces are limited and will be allocated on a first come, first served basis. Teams can be mixed and need a minimum of eight players in Year 6 or below. All players will receive certificates with trophies for the finalists. For more details or to enter the tournament email community@chesterfc.com or call 01244 371376. Chester FC and Chester FC Community Trust have teamed up to launch a new community ticket initiative. The ‘Backing the Blues’ scheme will distribute 1,000 free tickets to children between now and the end of the season to support Marcus Bignot’s side in their battle to remain in the National League. The free tickets are available to schools, charities, football teams, sports clubs, youth groups and community organisations from across Chester, Cheshire West and North Wales with discounted admission for adults available too. 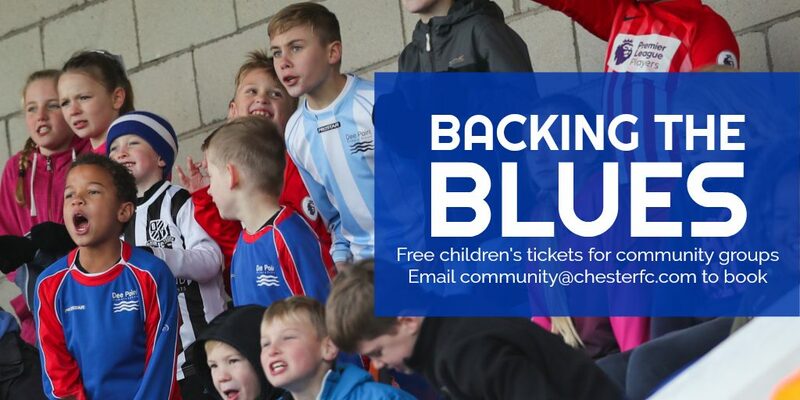 Children and their families will be able to watch the games from the MBNA South Stand and the club is urging them to make lots of noise and get right behind the Blues in their fight for survival. Applications are now being accepted for the crucial game against Gateshead on Saturday 20 January and ‘Backing the Blues’ tickets will be available for all remaining home fixtures with the exception of the match against Tranmere Rovers. Chester FC CEO Mark Maguire said: “The work carried out by the Community Trust fulfilling our responsibility as a community club is absolutely fantastic and this initiative which engages children and their families at a time when we are pulling together and battling for our National League status is a really positive move. Jim Green, chief executive of Chester FC Community Trust, added: “We are very grateful to the Club for supporting this initiative. “This is a really positive move and we are looking forward to welcoming lots of new fans between now and the end of the season for a massive run of games. In addition to free tickets for children aged 15 and under, community groups can access discounted £10 adult tickets and admission is free for all under-fives. There are a limited number of free tickets available for each match but additional children’s tickets are £3 each. Chester FC Community Trust is coordinating the initiative and tickets must be requested in advance. These will be available for collection outside the MBNA South Stand one hour before kick-off. To take advantage of the offer or for more information, community groups can call 01244 371376 or email community@chesterfc.com to request an order form. Chester FC Soccer Schools are running this February half-term with four days of high quality coaching and football fun on offer. Parents can now book places for children to attend two-day courses at Blacon High School and The Cheshire County Sports Club in Upton. Taking place on top class 3G pitches, Chester FC Soccer Schools run from 10am until 4pm each day and prices start from only £10 per day with an an optional 9am early drop-off available for £2.50 to help parents plan for the school holidays. Online booking is available through Eventbrite (additional booking fee applies) at community.chesterfc.com/book-online. The camps cost just £12.50 per day or only £20 for both days at the same venue. The optional 9am early drop-off available is an additional £2.50 each day. Children will need a packed lunch, snacks, lots of drinks as well as suitable footwear, shin pads and appropriate clothing. To book or for more information, contact Chester FC Community Trust on 07512 355396 or email community@chesterfc.com. Online bookings can be made at community.chesterfc.com/book-online. 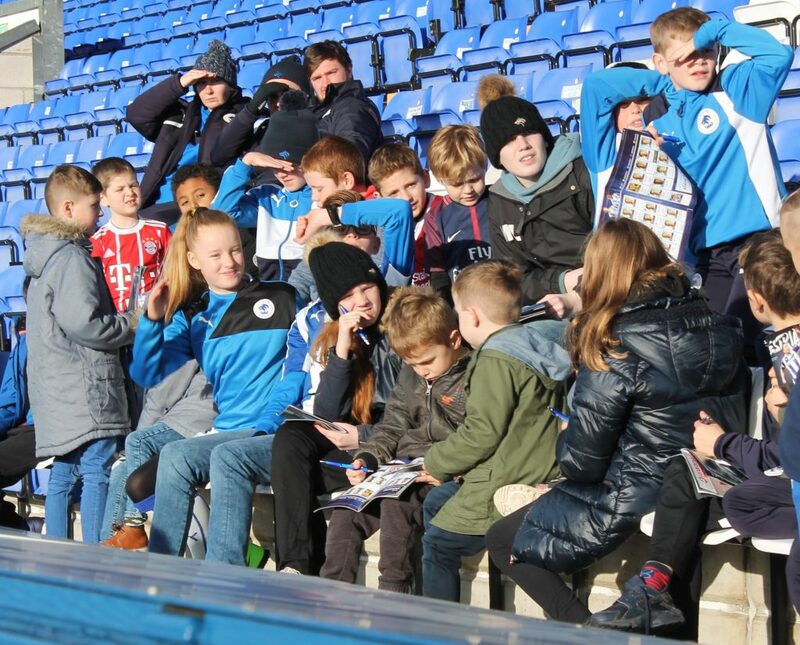 Chester FC Community Trust have produced a new brochure outlining their high quality curriculum and extra curricular provision for primary schools. Using the passion of football and the Chester FC brand, we work with schools to enhance their curriculum, support teaching staff and engage and inspire pupils to be more active and reach their potential. 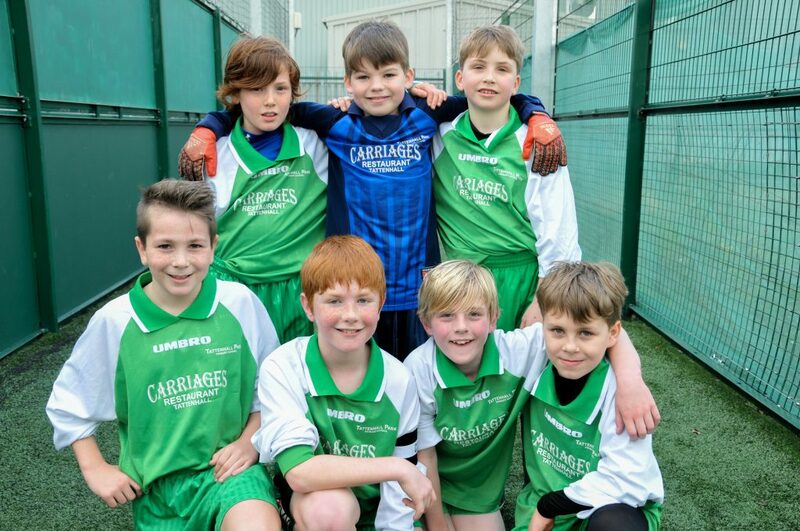 We have a knowledgeable and experienced team who deliver a varied programme including Premier League Primary Stars, PE lessons, PPA cover, extra-curricular clubs, enrichment experiences and competitions. As a registered charity, we are committed to building strong relationships with schools and place huge value on each partnership with bespoke, flexible packages and incentives and rewards for official Chester FC partner schools including match tickets, player visits and stadium tours. 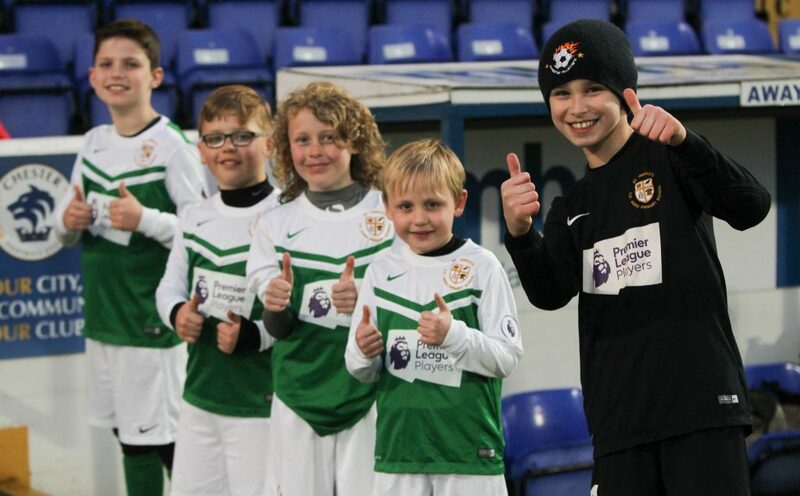 For more information about our schools programme, contact our team on 01244 371376 or email community@chesterfc.com. Chester FC Junior Blues had a fun-packed day as the fan-owned club hosted its annual Christmas party for young supporters. Youngsters descended on the Swansway Chester Stadium for the Festive Funday with lots of activities on offer for the football-mad crowd. The Junior Blues were given a behind the scenes tour before having the chance to have a kick around on the pitch and then watching the first-team train. There were football and festive-themed crafts and games to keep them entertained and Chester FC Community Trust provided lunch for everyone. Following training, manager Marcus Bignot and his squad spent time chatting with the Junior Blues, signing autographs and having photos. Chester FC mascot Lupus made a surprise visit to round off the day as he handed out selection boxes. Junior Blues member Leah Davies again demonstrated her talents as she produced this fantastic video of the day. If you’ve not yet renewed or want to join the Junior Blues, you can find a membership form in each edition of The Cestrian, pick one up at the Club Office or sign up online – just visit www.cityfansunited.com and click on ‘Junior Blues’ on the top menu bar. Membership prices have been frozen meaning it still FREE for children aged 4 and under, and only £5 for ages 5 to 15 – incredible value! 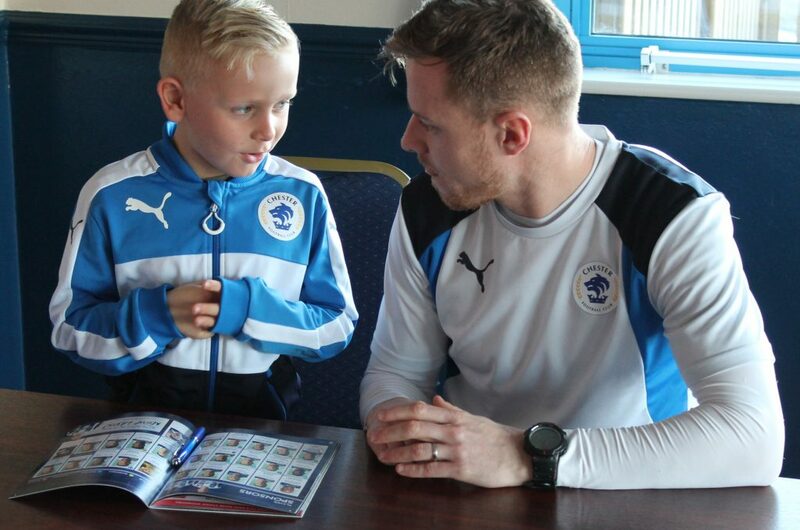 If you’d like more details about the Junior Blues you can email juniorblues@chesterfc.com or contact us on 01244 371376.